Compare the presentation of Childhood in Charlotte Bront&amp;euml;'s 'Jane Eyre' and Laurie Lee's 'Cider with Rosie'. 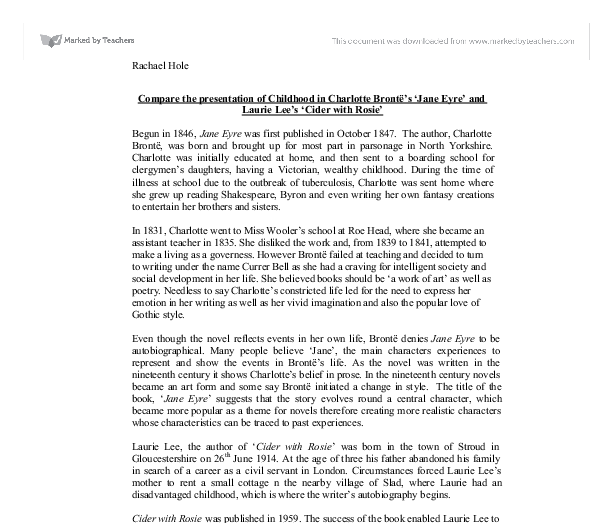 Compare the presentation of Childhood in Charlotte Bront�'s 'Jane Eyre' and Laurie Lee's 'Cider with Rosie' Begun in 1846, Jane Eyre was first published in October 1847. The author, Charlotte Bront�, was born and brought up for most part in parsonage in North Yorkshire. Charlotte was initially educated at home, and then sent to a boarding school for clergymen's daughters, having a Victorian, wealthy childhood. During the time of illness at school due to the outbreak of tuberculosis, Charlotte was sent home where she grew up reading Shakespeare, Byron and even writing her own fantasy creations to entertain her brothers and sisters. In 1831, Charlotte went to Miss Wooler's school at Roe Head, where she became an assistant teacher in 1835. She disliked the work and, from 1839 to 1841, attempted to make a living as a governess. However Bront� failed at teaching and decided to turn to writing under the name Currer Bell as she had a craving for intelligent society and social development in her life. She believed books should be 'a work of art' as well as poetry. Needless to say Charlotte's constricted life led for the need to express her emotion in her writing as well as her vivid imagination and also the popular love of Gothic style. Even though the novel reflects events in her own life, Bront� denies Jane Eyre to be autobiographical. Many people believe 'Jane', the main characters experiences to represent and show the events in Bront�'s life. As the novel was written in the nineteenth century it shows Charlotte's belief in prose. In the nineteenth century novels became an art form and some say Bront� initiated a change in style. The title of the book, 'Jane Eyre' suggests that the story evolves round a central character, which became more popular as a theme for novels therefore creating more realistic characters whose characteristics can be traced to past experiences. ...read more. This again shows different times changed the ways of discipline and how children were treated. The styles of both novels are very different. Cider with Rosie encompasses more than simply a child's life from age three to adolescence. It is far more ambitious. Other stories, other lives and other times fascinate the writer. Being an autobiography and with so much to cram into pages of his book the writer must be selective with his memories. As Laurie Lee has so many memories he wants to share with the reader, his style is not a sequential narrative. The unordered randomness of how the book is put together reflects the nature of the author and the unruliness and freedom of his life. Laurie Lee is simply writing the book in the order in which his memories seem most strong to him. As the book is written in this structure it sometimes makes the book hard to understand and it is very episodic as it is a series of reflected narratives. To avoid missing things out some chapters follow a structure of their own. Even though the story seems so inconsistent, chapters are used to help the story flow to end a certain time of his life, which is why the story appears episodic. For example the chapter 'winter and summer' informs the reader about the author's experiences in the different seasons of the year and how the villagers coped with altering their way of life. "The seasons (of course) so violent, so intense and true too their nature, that they have become for me ever since a perfection whenever such names are mentioned." This chapter in Laurie Lee's life informs the reader of the extreme differences the weather made on one's life living in such a remote area of the country. We are told about all his experiences during the different seasons of the year and how it affected the living conditions of the village. ...read more. Also I feel I am lucky with the amount of support and attention children receive. Education is taken very seriously and now if you do not have some sort of education you cannot strive out into the world. In Laurie Lee's time, education was not seen as a very important issue. As children were taught the family business, most children carried on the family trade. There was no need for education. Also men went off to war, therefore children would go of to the army at a young age at train to become officers. Even without knowing when the books were published, you are able to tell which book was written earliest. This is because the language used in the books, reflects what time in history they were published. Jane Eyre was published in the Victorian period when attitudes were very strict. The language of the novel is very difficult to someone unfamiliar with nineteenth-century texts. The sentences are long and complicated, and the vocabulary is elaborate. This form of writing was common at this time, in spoken and written language. Laurie Lee's language reflects the change in society. Also it shows that he is trying to write from a child's point of view. Language in early sections is often seen as deliberately childlike. This also helps the reader to understand the amount of freedom Laurie Lee had. A child's lack of uncertainty often comes through the author's choice of language. Laurie Lee also writes the way people would have spoken. This gives a clear indication of where the story is based as well as when it was written. Overall Laurie Lee's childhood was very ideal compared to Jane Eyre's. From reading and analysing the novel, Jane Eyre's childhood was very grim and as a result it made her a very emotional character. We almost feel sympathy towards Jane as we are given such a detailed image of her childhood. Laurie Lee showed the reader a much more free and idealised childhood while Jane Eyre illustrated a depressing and emotional upbringing. Rachael Hole ...read more. This student written piece of work is one of many that can be found in our GCSE Charlotte Bronte section. Jane Eyre - How has the character changed throughout the novel? She cannot understand his feelings, and is dismayed at the thought of marrying him - "- Can I bear the consciousness that every endearment he bestows is a sacrifice made on principle? No, such a martyrdom would be monstrous. I will never undergo it. When the Reed family are all gathered around a fire, Jane is excluded. "She reclined...with her darlings about her" the fire is being used to symbolise the feelings of emotional warmth which Jane is excluded from. Jane is constantly victimised by the Reeds and is bullied and also made feel worthless as if she is an outsider. How Is the Theme of Isolation Shown In Jane Eyre. The novel goes on and Jane matures but the memories of the red-room continue to haunt her. After the incident in the red-room Mrs Reed is anxious to send Jane to school. I think her negative and hostile attitude is caused by her belief that Jane replaced the place of her children in the late Mr Reed's heart. Explore the Theme of Education in Jane Eyre. 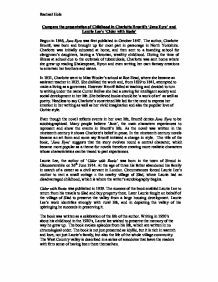 Bront� has written Jane Eyre in the first person, a technique which has several advantages. First, it engages the reader's interest in the story and the main character, because events are witnessed through Jane's eyes, and we are aware of her thoughts and feelings. Rochester is intelligent. He soon changes his attitude and says to Jane if she leaves he'll bleed from the inside and die. (Part One) The alliteration and adverbs ('calmly and coldly') capture the cruelty of Antoinette's mother's actions. The reader is able to see Antoinette as a whole character in 'Wide Sargasso Sea' as Rhys explores Antoinette's emotions and experiences. This differs from 'Jane Eyre's' depiction of Bertha, who is not a developed character. Jane Eyre Coursework - How do Jane's experiences at Lowood contribute to her development? Jane can play the piano well, speak French, paint and draw and "work on muslin and canvass", all of which classify her as "quite a lady". In the beginning at the insitution, the food is quite unedible: with burnt porridge in the morning and a meagre fair for dinner, the girls are always hungry.